Just like it did last year, RIFF will host Rajasthani folk musicians, along with musicians from different traditions and different parts of the world. “RIFF is a marketing tool," says festival director Divya Bhatia, who is also the artistic director of the Jaipur Virasat Foundation (JVF). 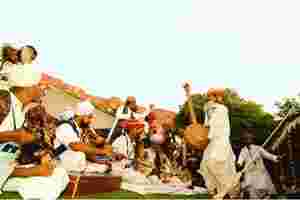 It is Rajasthani folk music and musicians that Bhatia and JVF are marketing, but not to make profits. The Hindi word virasat translates as heritage or legacy, and following the lead of Komal Kothari—the pioneering folklorist of Rajasthan who died in 2004—they seek to preserve and nurture the state’s folk traditions. The Manganiyar and Langa communities in the border districts of Jaisalmer, Barmer and Jodhpur in Rajasthan, whose male members have always sung for their jajman or patrons, find themselves in this predicament. The ties between musicians and their patron families are centuries old, continuing from one generation to the next. While the Manganiyars are Muslims, their patrons are Rajputs and accordingly, their vast repertoire of songs includes Hindu devotional songs, many of them dedicated to Lord Krishna. While the Manganiyars were never wealthy, their food and basic necessities were taken care of. But with families moving to cities and lifestyles changing at a fast pace, singing for jajman is no longer enough to make ends meet. “I am handicapped and I am a widow, but I get no pension from the government," says Rukma Devi, 50, from Ramser in Barmer, who is physically disabled from her knees down. “I get Rs1,000-1,500 when I sing, but that is not enough." A highly anticipated concert is the duet featuring Ustad Sultan Khan, the noted sarangi exponent in the Hindustani classical tradition, and the folk sarangi player Lakha Khan Manganiyar. According to Vinod Joshi, regional director, JVF, Lakha Khan and other artists “will have new avenues open for them". Bhatia points out that this collaboration won’t end at Jodhpur—Sultan Khan and Lakha Khan will be performing again at the National Centre for Performing Arts in Mumbai later this year. On the other hand, the fact remains that it is those who continue to perform in the traditional mode for the jajman who find artistic inspiration and nourishment to make their art form grow. This fact is not lost on the Manganiyars. 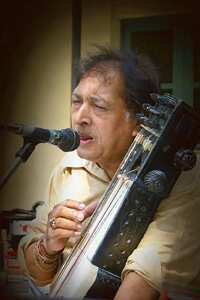 Anwar Khan Manganiyar will provide vocal accompaniment to Ustad Sultan Khan and Lakha Khan at the RIFF concert. He has recorded a song for Ketan Mehta’s new film Rang Rasiya, performed in Milan recently, and in the coming days will also perform in Paris and Holland. Yet he, like all other Manganiyar musicians interviewed, is at pains to emphasize that first and foremost, he is there for his jajman. “We and our music are because of them," he says. Singing to an international audience at the invitation of Maharaja Gaj Singh of Jodhpur fills him with pride, but he knows where the fount of his music lies. Singing for jajman, he says, “fills one with joy… we sing of the soil, the hills, the plants, food". He also likens the singing to riyaaz or practice. “Our jajman will interrupt our singing, tell us that we skipped the antara. They’ll tell us, ‘This is how your grandfather used to sing’." An audience unfamiliar with their music, or one that is only cursorily familiar with it, cannot substitute for jajman. Like the Manganiyars, folk artists all over India are grappling with change. “We want to set in motion a process, a model which, once its efficacy is proved can hopefully be replicated across the country," Bhatia says.